Who will better represent this District – Simcha Felder or Blake Morris? MIDWOOD — Blake Morris celebrated earlier this week with supporters outside the Avenue H subway stop in Midwood the 4,000 + signatures that put his name on the ballot in September Democratic Primary as a challenger to Senator Simcha Felder, who represents Senate District 17 – Borough Park, Flatbush, Kensington, Mapleton, Midwood, Sheepshead Bay, and Sunset Park. Felder, who runs across the party lines come election day, yet has been voting with Republicans since he was elected in 2012. Morris is the first Democrat to challenge him in 6 years. You will see Felder running again on the Republican, Conservative, and Independence Party lines, Morris may succeed in kicking him off the Democratic line, and the Reform Party will be running Luis Rivera as an option. “Thank you to all of our volunteers, our staff, and the thousands of people who signed petitions to put a real Democrat on the ballot on Thursday, September 13th,” Morris told the crowd. Felder famously said that if you were looking for a real Democrat to represent you, “I’m not your guy”. Morris promises to support the issues that Felder has been blocking, like bringing speed cameras to school areas and passing the Reproductive Health Act. 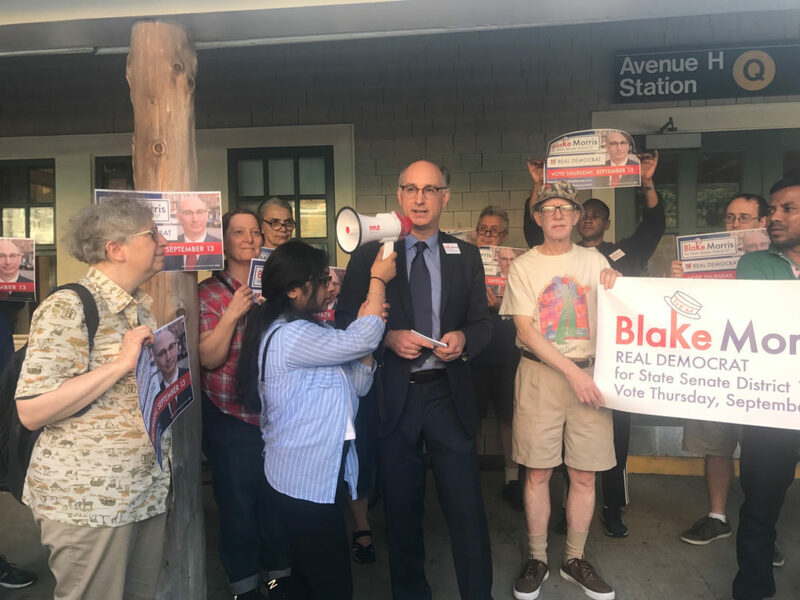 He also supports the New York Health Act that would create a single-payer health care system across the state – legislation that has been passed by the Assembly and stuck in the Senate for years. 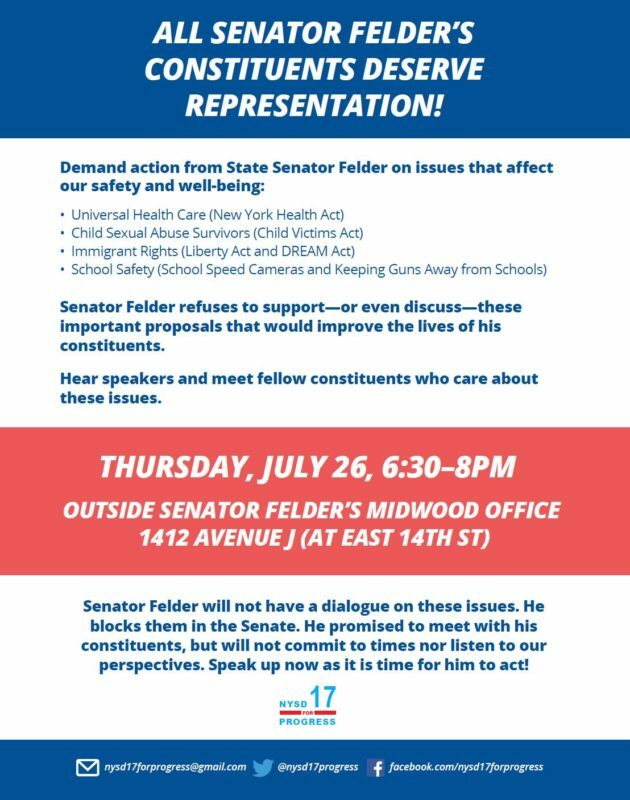 Felder for his part touts his loyalty to his constituents, a great majority of whom reside in the heavily Orthodox Jewish areas of Borough Park and Midwood, and putting them and their interests first above party politics, be they Democrats or Republicans. He boasts that “no other office can beat him” at constituent service, and takes great pride in his “common sense” approach to legislation. Felder strongly opposed the plastic bag bill, speed cameras by schools, wants to increase the speed limit on the Ocean Parkway, is against select bus service, really wants to station an armed guard outside every school, and believes there should be special education standards for Yeshivas. He has also been incredibly effective at bringing money to his core constituent base – he took home $1.2 million of the state’s $16 million in discretionary funds this spring – more than any other senator in New York. Most of it went to Agudath Israel ($850,000) and other Orthodox Jewish community institutions. Midwood Library received $30,000 and a handful of public elementary schools received either $5,000 or $10,000. Felder seems to be only interested in talking about what he wants to talk about – like chocolate rugelach rather than speed cameras – no matter who’s asking the questions. Felder has way more money in his campaign chest than his opponents, based on the latest filings (July 16th, 2018): Felder has raised more than $430,000 since January, whereas Morris had raised $41,000, leaving them with account balances of $637,000 and just over $10,000 respectively, after expenses. How stupid do you think we are??? I’d take a chocolate rugelach over the horse s*t you’re trying to force feed us here any day! What are you talking about, Concerned Citizen? What do you think Brklynr is trying to shove down the readers’ throats?? Don’t you think that Simcha Felder should address important issues in his district? 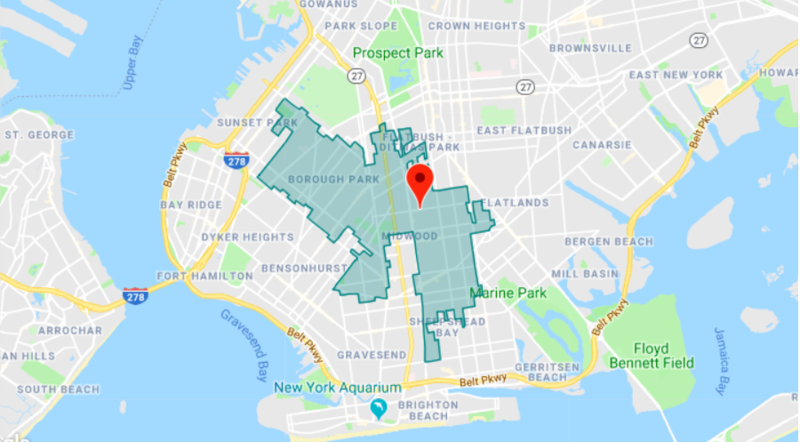 Felder is commendably active and successful in forwarding the interests of the large Orthodox Jewish communities in Borough Park and Midwood, but it’s outrageous that he’s obtained so much money for organizations that serve only one group in his district. Compare what he’s obtained for the Orthodox organizations ($850,000) to the paltry sums for the public library and public schools. Shouldn’t public institutions serving all the people in his district get a better deal out of their (ostensible) representative in the state legislature? I like rugelach too, but I love my library even more. Simcha Felder is an incredibly selfish human being. It’s obvious to everyone that all he cares about is his narrow self interests, and those of whom he serves, the rest of us be damned. That’s fine and great for some people, but terrible for the rest of his constituents, and for New Yorkers and Americans more broadly. Concerned Citizen, based on you unintelligent and flippant comment, I can only conclude that you are exactly the kind of self-interested person that is attracted to a politician like Felder and the very specific constituency that has helped support him over ??? ??????? ???? ?? ??? ???????? – ???? ?, ??????????? ?, ?? ???? ?? ?? ???? ???? ?, ???????? ?, ??? ???????????. The orthodox community should ??? control the district and use it to put ????? particular interests ???? those of everyone else. This is a key problem with Felder and that community in general, and ??? ?????. This article is so unbalanced that it could have been written by collection agency lawyer Larry Blake Morris. No where is written of what qualifications Morris has which would make him a better representative for our district. Morris appears to be rehashing the same socialist views of the 78 years Bernie Sanders, a self hating intermarried Jew who bashes Israel at will and the pro-Palestinian rising star of the Democratic party, socialist Alexandria Ocasio-Cortez. A truly balanced article would have mentioned that Morris is a collection agency lawyer. Who are Morris’ clients? Does he represent credit card companies? Banks? Hospitals? Real Estate owners? Auto Dealers? 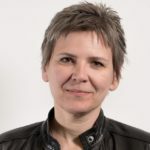 Let’s have openness Morris – who are your clients? Twice, I challenged hospital bills, one from Mt. Sinai, the other from NYU successfully. However, during my challenges, I was harassed and then threatened by collection agencies lawyers, even though I was in the appeal process. If this is Morris’ primary legal practice, then Blake, who are your clients? A collection agency lawyer, in my opinion, does not represent the consumer, but corporate interests, as such, Morris’ fitness to hold state office may be full of numerous conflict of interests. Jewish voters, especially those with large families, should be outraged that Felder is holding up the NY Health Act. That would benefit them more than any of the things Felder has done. I am supporting Blake Morris in his campaign to unseat Folder. It is time for the elected officials who have been only focused on self interest and not the interests of the people to be removed. It is time for the elected officials who take funds from corporations who are the reason our communities suffer whether it is with inadequate healthcare, high rents, etc, to be replaced with challengers who are true advocates for the people. Felder never worked outside of government. On the other hand, Blake Morris represents corporations in collecting unpaid bills. Translation: Blake Morris is a collection agency attorney. Based on your comment, Morris is funded by corporations. Morris doesn’t even have transparency with his legal practice, his office is in Ditmas Park but uses a PO BOX with a Manhattan address as his return address. Why? Will Morris please publicize who his clients are to avoid any conflicts? Probably not and if he did, people like you wouldn’t care since Morris, like all leftists, are given a free pass (just look at the Clintons). Our inadequate healthcare is caused partly by Gov. Cuomo allowing hospitals to merge and the state’s mismanagement of the Obamacare plans (Health Republic was not monitored and went bankrupt, Fidelis is being sold, Connect Care was allowed to shut down, etc.). High rents can be traced back to Cuomo’s father’s administration which allowed rent control buildings to go co-op which took thousands of rental apartments off the market. Cuomo & Cuomo Sr. = Democrats. Blake Morris talks a good socialist game but did he ever give a break to someone who disputed a collection claim? A benefit of doubt. Probably not. Much as I like chocolate rugelach, I love the library even more. There’s a serious funding imbalance between the private (Agudas Yisroel, for example) and public institutions in Sen. Felder’s district. Felder is representing a group of his constituents who will vote as a bloc. That’s perfectly legal and ok, but the only solution is to vote for Morris or another candidate, if only to signal to Felder that not everyone in the community cares more about yeshivas than they care about the public schools. No elected official is invulnerable to a groundswell of voters who feel that their interests are not being represented. Emil this the second time you are making this similar statement. Felder delivered more money for the district than any other State Senator. If one deducts the money he steered to Orthodox interests, which make up about half of the constituents, the remainder amount, that sent to places like libraries, is still greater than other State Senators delivered to their district. By making this a major issue, Morris is showing that as an assimilated Jews, that he is a typical leftist self hating Jew in the mold of Woody Allen. The only groundswell of voters in our district are about 200 socialists who want open borders, elimination of ICE, reduction of police, decriminalization of pot, favor public urination, green cards for all illegals, and the welcoming of course without screening,millions of immigrants. etc. As a veteran, I want the border wall built, not only to keep out illegals, but to keep drugs flowing across our borders, especially after my niece overdosed last year. I strongly disagree with Morris and his supporters who want open borders; if one locks their doors at night, then a country is obligated to patrol and protect our borders.